Home > Find by Parameter > NTU - What is Turbidity? Turbidity is the measurement of light scatter and is typically reported as NTU nephlometric turbidity units. NTU refers to the 90° angle of measurement used for water quality measurement for drinking water applications. Turbidity measurement is also commonly used for final effluent monitoring to infer suspended solids concentrations affecting water quality. 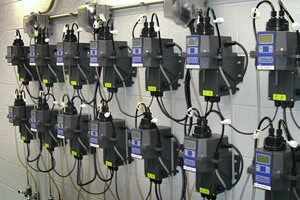 Different types of turbidity instrumentation are available for drinking water and final effluent monitoring. The microtol is typically installed for flow through measurement of drinking water quality. Primetime (non-harzardous) primary calibration standard, are available for multiple point calibration including a 0.02 NTU set point. 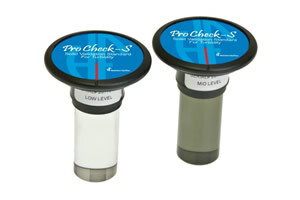 Additionally the ProCheck-S solid state validation standard provides a rapid performance test to determine when a complete primary calibration is needed. 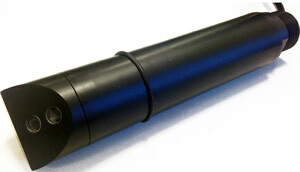 The WTW Visoturb sensor is a robust submersible probe that incorporates continuous ultrasonic cleaning, 90° light scatter measurement combined with a backscatter technique used for diagnostics and the very best optical measurement window. Whilst primarily designed for waste water monitoring, digital range selection allows detection from 0.01 NTU and selection of five measurement scales to 4,000 NTU. The Chemitec S461TN sensor is designed for waste water applications and features an optical face mounted at 45° to prevent air bubbles from adhering to the optical face. The digital sensor uses an IR light source and nephlometric 90° light scatter measurement over the different scaling range 0-4,000 NTU and can re-scaled to suit the application. The sensor is supplied pre-calibrated but the user has the possibility of performing a single or dual point calibration or alternatively expressing readings as mg/L suspended solids. Temperature is also integrated as standard. The sensor can be directly mounted in a tank or flow cell. 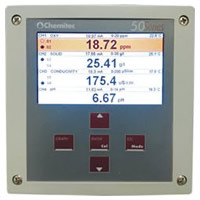 The Chemitec S461LN is an alternative sensor designed for water and waste water measurement over the range 0-100 NTU. The optical face is again mounted at 45° to prevent air bubbles from adhering to the optical window. The digital sensor uses an IR light source and nephlometric 90° light scatter and is supplied pre-calibrated but the user has the possibility of performing a single or dual point calibration. Temperature is also integrated as standard. The sensor can be directly mounted in a tank or flow cell. On line low cost, flow through Turbimeter for low level measurement.